Councils in the Lothians are keen to grow bike use, but face similar problems of budget cuts, extensive new greenfield housing, scary A- and B-roads, and inadequate funding and coordination on cross-boundary cycleroutes. 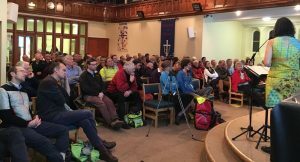 These were top messages from our packed-out public meeting on cycling plans in Edinburgh and the Lothians. The 110-person meeting was our first to be live-streamed – and also brought remote questions. We even saw a tweet from a top Council officer who was following the meeting on twitter! We were also delighted that 2 councillors (both Spokes members) turned up in the audience! – Cllr David Key, Edinburgh’s Cycling Champion, and Cllr Chas Booth, Green Transport Spokesperson. Before and after the meeting our #Spokes40 birthday exhibition and slide presentation were on display – these materials and 3 anniversary videos will be on our website around mid-November. For Midlothian, Cabinet member Cllr Russell Imrie wanted widespread separated provision for cycling, as he had seen in Europe. The Council would be pressing developers, who are often reluctant to include this, but it would be a much longer task retro-fitting into existing built-up areas. A major opportunity will be a new A701 corridor for ‘public transport’ (the term included cycling & walking) but this depends on a new alternative road being built [more below]. For West Lothian, Development & Transportation Manager Jim Stewart said the Council was working on gaps in their strategic cycling network, routes to stations and routes connecting communities. There will also be a pilot rural-road walk/cycle priority scheme in the Bathgate Hills. For East Lothian, Cabinet Environment Spokesperson Cllr Norman Hampshire had to withdraw at the very last moment. Although we therefore did not have a speaker, the now-retired former East Lothian cycle officer Paul Ince, who was at the meeting, was press-ganged into joining the discussion panel in a personal capacity. For Edinburgh, Transport & Environment Convener Cllr Lesley Macinnes emphasised her and the Council’s ambition to move further from a car-centric city to people-friendly: “We get it,” she said! She listed the council’s major schemes (West-East route; Meadows-George St; West Edinburgh network; Leith Walk) and the many small route-linking projects. She also emphasised Council responsiveness when serious concerns arose, as with Silverknowes roundabout and postponing Picardy Place decisions to allow wide public consultation. She also repeated her intention to get an electric bike. 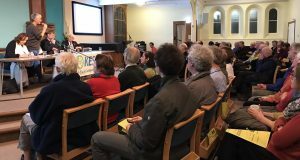 The 1-hour panel discussion was chaired by Sustrans Scotland Deputy Director Daisy Narayanan, and was also joined by SEStran active travel officer Moira Nelson. As we had hoped, the meeting was not Edinburgh-dominated, and there were many questions specifically on the Lothians and on cross-boundary issues – frequently from people who live and/or work in those council areas. We have included some relevant links and Spokes notes. Cllr Chas Booth asked how cross-boundary routes could be funded, when Councils understandably want to invest their scarce cycling cash nearer their centres of population, and asked about the role of RTPs (Regional Transport Partnerships). RI reminded us that RTPs used to have capital funding, and SEStran, our local RTP had started investing substantially in cross-boundary routes – but RTP funding had then been scrapped by the first SNP government [Spokes example – see para 2007]. Panel members from the Lothians agreed that RTP cross-boundary funding would be very helpful, whilst LM hoped that the big increase in cycle funding recently announced by the government would filter through to cross-boundary projects via Councils or some other means. MN: SEStran has designed a Musselburgh-Edinburgh route [see page 2 here] but has no funding to build it, and is having difficulty persuading potential contributors to do so at a time of cuts. 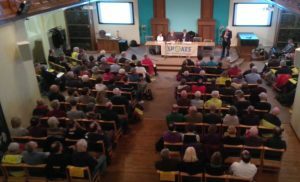 All speakers urged, in response to questions and in speeches, that individuals and groups keen to see better cycling provision should frequently speak to councillors and MSPs, and always play a full part in public consultations on road and traffic schemes. This was now more vital than ever at a time of massive cuts in local authorities, where choices between spending alternatives were critical. JS: The £400m West Lothian Council budget, for example, must be cut by 20% within 5 years. LM: Investment in active travel should be seen in part as preventive spend – cutting health costs, reducing pollution & congestion, etc. A89 JS: The A89 cycleroute is a major West Lothian spine east-west route and is now virtually complete from Edinburgh to Bathgate [map – doesn’t show latest construction] He accepted there are problems at some road crossings, and will look further at the roundabout approaching Bathgate. A71 JS: No cycling provision, and a deterrent to travelling by bike. Provision would be costly and falls between 2 councils, so a classic case where regional funding is needed. A701 RI: As a result of a planned A701 relief road Midlothian wants the existing A701 to become a ‘public transport (including cycling) corridor.’ RI repeatedly urged concerned members of the audience to lobby Midlothian councillors for high quality cycling provision on this road – it is not a given. He also pointed out that Straiton A701 bypass crossing also needs drastic attention for cycling [Spokes note – there is however dissension as to whether the relief road should be built, given that it is likely to generate more car travel]. A68, A7, A702 Question: these are fast, dangerous roads – could the footways in rural sections be upgraded & designated for cycling. RI: Midlothian is looking at trying this initially in Gorebridge area, and RI would be happy to be emailed about other dangerous road sections. However the A702 and A68 are trunk roads, so are government responsibility – Midlothian Council has tackled the government unsuccessfully re A68 cycling conditions, and concerned individuals should do the same [find your MSPs here!]. Musselburgh to Edinburgh See ‘Regional coordination’ above. B-roads and minor roads Question: Many non-A rural roads are also dangerous for cycling, due to unsafe and/or intimidating traffic speeds. Can Lothians Councils adopt the Clackmannanshire Cycle-Friendly Roads policy? JS: WL Council is working on a pilot scheme for the Bathgate Hills road network, based on Clacks ideas. RI: Was unaware of the Clacks initiative, but will ask his officers to look at it. Question: Some companies elsewhere in Scotland carry bikes, and there used to be an Edinburgh-Glentress bike-bus. LM: Likely to be problems, but will raise with Lothian Buses, particularly for the longer routes into the Lothians – could be useful for leisure as well as local travel. A huge issue raised in speeches, but which did not appear in the QA session, was the question of new housing. Councils are expected to provide huge new areas for housing. RI: Current Midlothian population is 90,000 but the council has to provide land for 20,000 new houses (over what period?) [Spokes note: we believe huge increases also coming in East and West Lothian; Edinburgh is here]. Spokes note: Although not stated in the meeting, existing road systems may well be unable to cope if car ownership and use remains as now. There will be huge pressure for new roads – indeed, this may be one of the factors behind the proposed A701 ‘relief road’ above. Will councils adopt really tough policies on location of development, provision of facilities, car restrictions, and incentives to ‘go active’ – to keep motor use down and avoid new main-road building? Edinburgh bike share LM: hope a scheme will start in Spring 2018. Meadows-canal route LM: was delayed due to staff losses and the need to prioritise the west-east route, but consultants just appointed to progress it. Check out the article carefully. You will find several suggestions from speakers and from Spokes as to who you can usefully email about what. Contact your councillors and/or MSPs at writetothem.com.